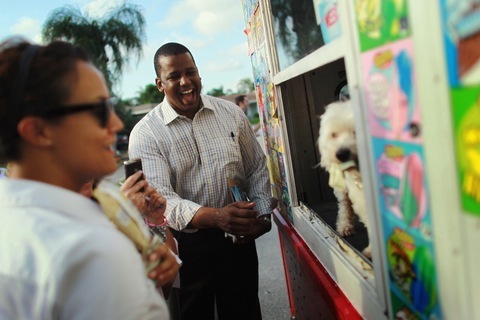 For Rep. Kendrick Meek, D-Fla., ice cream might be inexpensive, but he and other candidates are on pace to exceed $2 billion in campaign spending this election. Photo by Joe Raedle/Getty Images. A lot of attention has been paid this year to the vast sums of money interest groups have been pouring into the midterm elections. As it turns out, however, those organizations have nothing on the candidates themselves. According to a report Tuesday by the Washington Post, candidates are on pace to exceed $2 billion in spending. “As of last week, House and Senate campaigns reported taking in more than $1.5 billion, exceeding the total collected by congressional candidates in 2006 and in 2008, FEC data show. Most of that money already has been put toward advertising and other expenses. The Public Campaign Action Fund, a watchdog group, will release a study Tuesday predicting that House candidates alone could spend nearly $1.5 billion by the time the dust settles on Election Day. The calculation is based on previous elections in which about half of a campaign’s money was spent in the final month of the contest. Not only do Republicans candidates hold a $30 million fundraising advantage over Democrats, but those much-talked-about outside groups that are projected to spend upwards of $400 million are mostly targeting Democrats as well. Combine the GOP’s advantage in money with its more enthusiastic base of voters, and it’s no wonder most political experts believe Democrats could find themselves in the minority in at least one house of Congress next Tuesday. Andy Kohut of the Pew Research Center looks beyond 2010 and checks in on President Obama’s 2012 standing. “Two years ahead of the next presidential election, the public is divided over whether Barack Obama should run for a second term as president. About half (47%) say they would like to see Obama run again in 2012, while 42% say they would not. This is better than the outlook for Ronald Reagan in August 1982; at that point, just 36% of the public said they wanted to see Reagan — who subsequently went on to win his second term by an 18-point margin — run for reelection,” writes Kohut. And Gallup is out with its latest look at the enthusiasm gap between the parties and finds it hasn’t diminished for the Republicans as Election Day draws near. “63% of Republicans and Republican-leaning registered voters say they are more enthusiastic than usual,” writes Susan Page of USA Today. That’s compared to 37 percent of Democrats or Democratic-leaning registered voters. Monday’s Kentucky Senate debate proved to be considerably more civil than the last meeting between Republican Rand Paul and Democrat Jack Conway. When the two candidates debated eight days earlier, Paul refused to shake Conway’s hand after the Democrat questioned Paul’s behavior as a Baylor University student nearly 30 years ago. Paul threatened not to attend Monday’s fifth and final meeting with Conway in Lexington, but in the end he showed up, and the two stuck mostly to their differences on policy. Conway, who trails Paul by five points in two recent polls, went on the offense, charging that his opponent had changed his position on a so-called fair tax proposal that would replace federal payroll taxes with a 23 percent sales tax. Not backing down, Paul accused Conway of intentionally withholding certain facts in his attacks. “You oversimplify things into sound bites because all you care about is winning,” Paul said. Paul and Conway also sparred over environmental legislation, health care, taxes and how the remaining funds from the 2008 bank bailout should be used. After dismantling New York City’s term limits law so he could run for a third term, Mayor Michael Bloomberg has announced that he will vote in favor of a ballot initiative next week that will restore a two-term limit for all of his successors. “Bloomberg’s Latest on Terms: 3 for Him, but Only 2 for Everyone Else,” reads the New York Times headline. The billionaire mayor who has been a Democrat, Republican and now an independent worked legislatively through the City Council to upend the law on term limits voted into place by New York City residents in the early 1990s. He said the economic recession was an extraordinary circumstance that required the change so that he could continue to run the city. Once the law was overturned, Bloomberg was successful in his bid for a third term. Polls at the time showed voters disagreed with Bloomberg on the issue (they now show agreement about restoring the two-term limit), but the discontent was not enough to derail his candidacy. Should he choose to pour billions of dollars into an independent presidential bid, potential opponents in 2012 might be able to use the issue against him.